This node changes the size and resolution of a mask. To add a Change size node, right click in the Graph Editor and select Create Node > Mask Transformation > Change size. 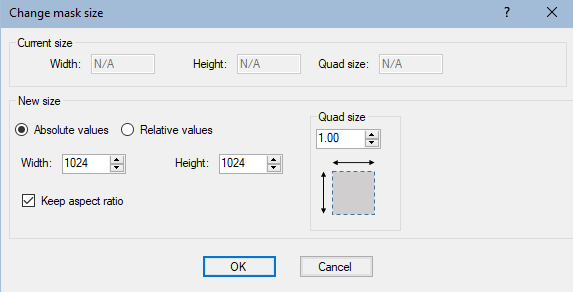 The Current size in the parameters dialog displays the current mask Width and Height in meters and the Quad size of a grid quad. Use the New size fields to change the Width and Height in meters and the Quad size of the mask. Toggle between Absolute values (meters) and Relative values (%). Check the Keep aspect ratio box to preserve the proportions of the mask when you change one value.